Is there a difference between comfort food during winter and that eaten at any other point in the year? In a nutshell, no. I eat the same comfort food throughout the year. The key difference is that during winter I eat it more often. This is the beauty and the appeal of winter cooking. Winter is not a time for salads, grilled fish or light pastas and we all know this to be true. Unless of course you live somewhere like Brazil. When you live in Scotland winter is all about seeking comfort where you can get it. And lets be frank here, on a freezing cold night you can have the thickest blanket, a roaring fire and a snuggly onesie but none of them will compare to a steaming hot bowl of stew. The genius behind it is that everything you class as comfort food and want to eat more of on a regular basis becomes de rigueur during winter. There is no need to balance out the dinners with a carb free or low fat meal. You can justifiably spend a week eating mac & cheese, mashed potato, risotto, stew, bread and steamed pudding without the guilt because its what your supposed to be eating. This series will focus on those foods we love to eat but which we go easy on throughout the year. However during winter we can with reckless abandon indulge ourselves in a little comfort seeking. I will undoubtedly always have leftover gravy and what is a pie without gravy? However you can make this from scratch with uncooked chicken and make a gravy from the stock. If so, then I would advise aiming for a mixture of breast & leg meat for maximum flavour. This will serve 3 generous portions but if you want to stretch it further you could use a larger dish, add more meat or vegetables or simply double or triple the quantities depending on how many you are feeding. If you’re using leftover chicken then shred into bite-size pieces and set aside. Otherwise poach the chicken in the stock for 30-40 mins over a medium heat. Meanwhile, trim and wash the leeks and slice into thick rounds. Chop the onion and celery. 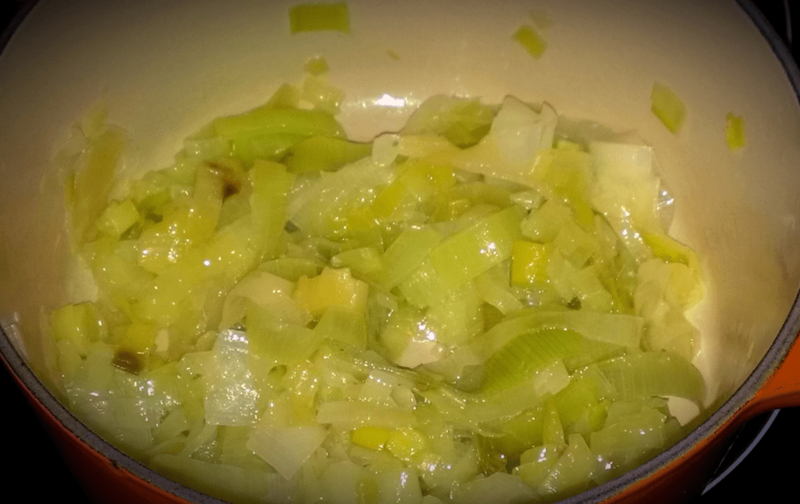 15 mins before the chicken is cooked throw the leeks, onion and celery into a separate pot with the oil & butter. Cook over a low heat with the lid on for 15 mins. After this the leeks should be soft, sweet and translucent. When the chicken is ready remove it from the poaching liquid & leave to rest on a chopping board. Do not throw away this liquid (this will be used to make the gravy). Instead keep it warm over a low heat. Take the pastry out of the fridge so it’s easier to roll out later. Stir the mustard & lemon zest into the leek mixture then stir in the flour. 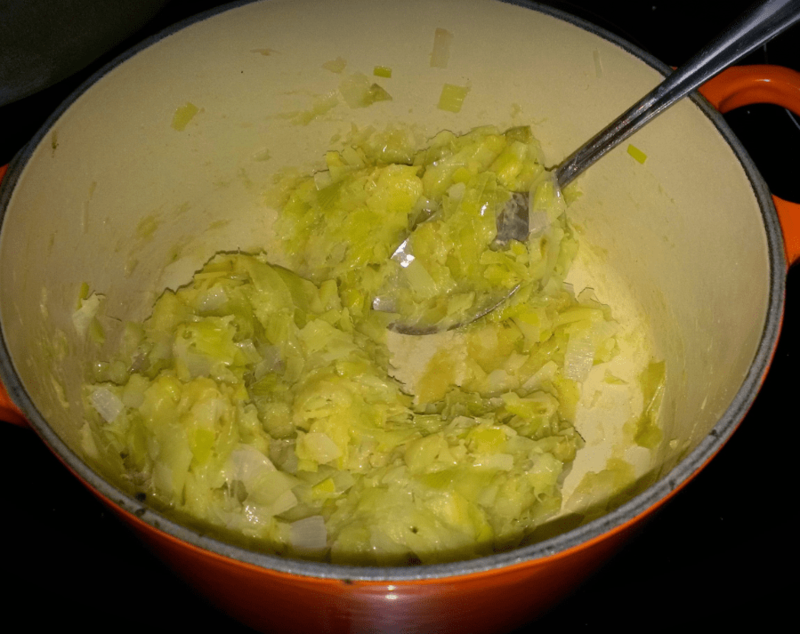 The leek mixture will instantly thicken up and become quite sludgy but stick with it. You are making a roux to thicken the gravy. Cook and stir over a low heat for 1-2 mins. Slowly add the poaching liquid to the leek mixture, one ladle at a time, mixing well between each addition. 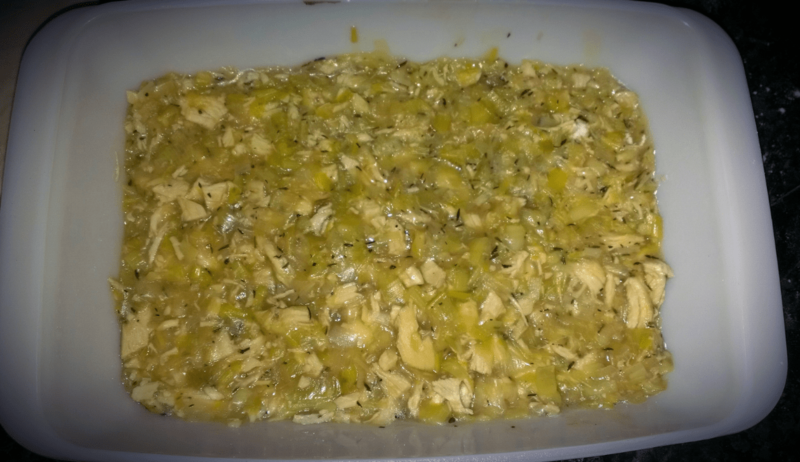 Toss in the chicken & cook over a medium heat, partially covered, for 15 mins. 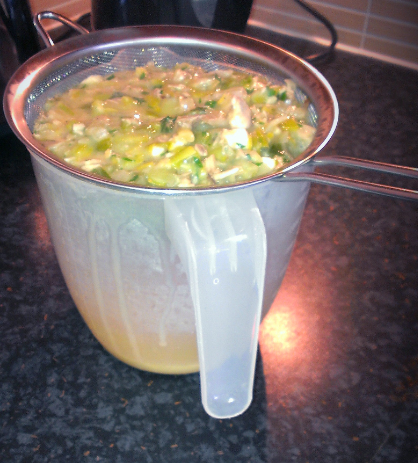 When the chicken & leek mixture is cooked place a sieve over a jug and pour the mixture over the top. Strain out most of the liquid until you have a thick filling left in the sieve. Pour the liquid back into the pot & keep warm over a low heat with the lid on. Spoon the filling into a shallow pie dish. Leave to cool while you prepare the pastry. Heat the oven to 180C. Roll out the pastry until it is just a little larger than the pie dish and trim. Use some of the scrap pastry to cut out small shapes and designs if you like. Leaves are always good as are fishes, initials, happy faces or you can go to town and break out the cookie cutters. 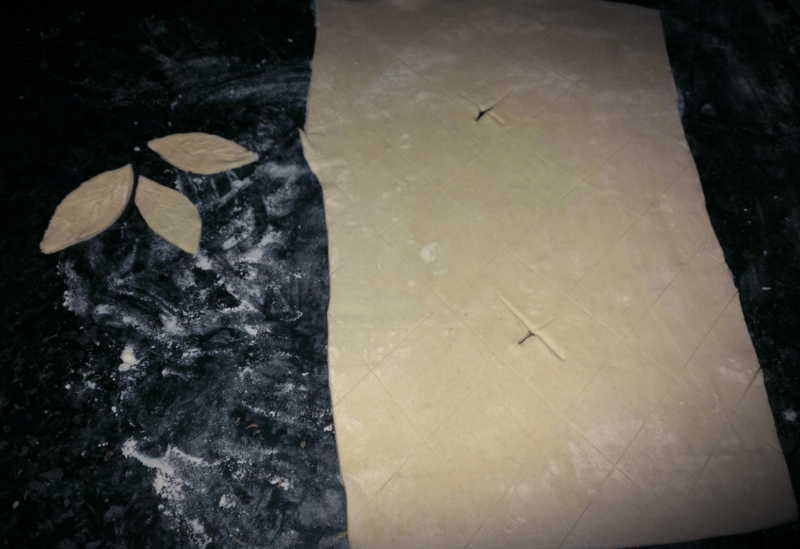 Score the pastry lightly with a knife in a criss cross design but avoid cutting all the way through. Then cut 2 crosses for steam vents. Lay the pastry over the filling. 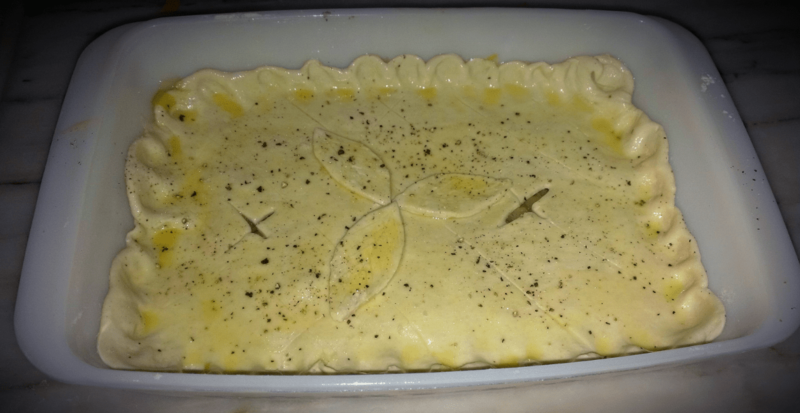 Crimp the edges by pushing your thumb against the pastry up against the sides of the pie. 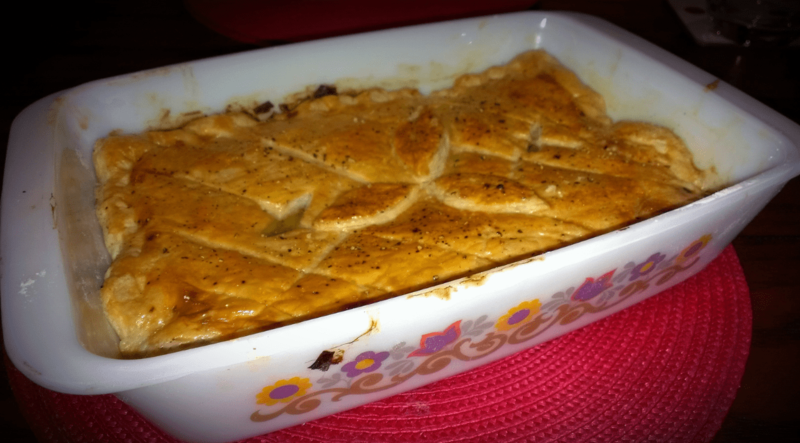 Brush the pie with beaten egg, lay the shapes on top and brush those with egg. Season with salt and pepper. Bake in for 30-40 mins until golden brown. Meanwhile tend to the gravy. Cook it over a low heat and taste for seasoning. If you prefer a darker gravy then mix 1tsp of Gravy Browning with 1/2 ladle of hot water and pour it in. Keep warm until ready to serve. When the pie is cooked leave it to rest for 5 mins before serving. Now that the gravy & filling have been separated you should find a slice of pie will hold its shape much better once served. Plus you get a denser, meatier portion. Smother it with gravy and serve with your choice of green veg and mash for full on comfort factor.